Why is the Broadwell-powered Zenbook UX305 already winning awards? Asus has announced the Zenbook UX305, a sleek 13.3-inch notebook that comes with Intel's fifth-generation Intel Core M processor. Under the bonnet is a 128GB SSD that's backed up by 8GB of RAM. 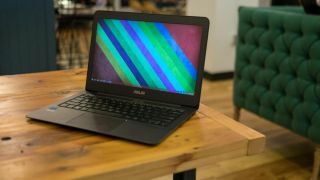 Intel's Broadwell chip has allowed laptop makers to introduce fanless designs, and the Zenbook UX305 gets the treatment. According to Asus, it features a thermal management design that allowed it to remove cooling fans to make it fast yet completely silent when in operation. The UX305 measures 12.3mm thick and tips the scales at 1.2kg. Connectivity-wise it has three SuperSpeed USB 3.0 ports to offer a higher level of speed on data transfers, and it supports Asus Charger+ technology that makes it faster to charge up mobile devices such as smartphones and tablets. Rounding off the connectivity features is a USB-to-Ethernet adapter and a mini DisplayPort-to-VGA adapter for connecting to a display. The Zenbook UX305 races of the traps with a design gong in tow having picked up the Good Design Award from the Japan Insistute of Design Promotion, and a place on the Good Design Best 100 list. Top level sound has not been left out of the ZenBook UX305's repertoire and the SonicMaster audio, which incorporates ICEpower, Bane & Olufsen technology promises to bring booming bass and crystal-clear vocals. ASUS has confirmed that Currys/PC World and John Lewis will soon stock the 1080p version of UX305 for £649.99. Currently pricing is only available in the United Kingdom, but we will update this article as soon as new information in the United States becomes available. Best laptops 2015: which notebook should you buy?